I'm waiting to check mine on Sunday. That will have been a full week sitting after a charge. If it were one of my Gotway or KingSong wheels, it will read 100-percent. Ninebot will never be able to fix the battery drain completely because both batteries status are always going to be constantly monitored, as evidenced by the "Blue/Red" flashing led on each battery! The very best we can all hope for is that the real world standby consumption is actually reduced, as stated in the BMS 1.1.7 release notes. Unfortunately, by design, power is always being drawn from both batteries for the smart/safety reasons deemed necessary by Segway-Ninebot's engineers so software changes can only go so far! Best solution is to charge to 100% then go ride/enjoy the wheel as often as is humanly possible, that's what I fully intend to do with my Z10! I made the same kind of observations more than a month ago. These had shown a voltage loss of about 0.0038V per hour. It's not enough but it's enough to empty a fully charged battery in about 4 months. So for low charged batteries as they are when shipping from China, it is normal that they are delivered in deep sleep state. The value of 0.0038V / h is an average value obtained on the two Z10 batteries by several readings on stand-by times each time greater than 4 days, on two different Z10 wheels of the 1832 series. Over 42 hours, we can expect a loss of 0.0038 x 42 = 0.16V. When I go to version 1.1.7 I may see it more clearly. The Z10 absorbs standby current 1500 times higher than an MS3 through its XT60 connectors. The total stand-by current flowing through the XT60 connectors is 150 micro-amperes. Welcome @Filalapat to the English speaking forum. Keep up the good work. This is exactly what 9B wants: Do not forget your BabyZ, care it, ride it everyday. Else it will suicide. When I updated to the latest firmware 7-days ago, I left the wheel alone to see what affect this update had to the phantom power drain. Not much. The battery level was showing 96% At that rate it would be down ~20-percent after ~1-month of inactivity. 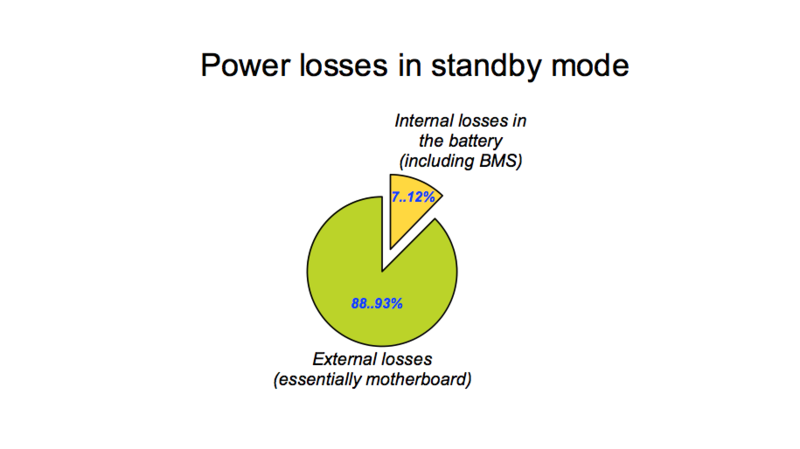 Maybe the firmware stops the power drain when it gets down to the single-digits? But if that's the case I don't know why it couldn't be turned off all of the time. Out of curiosity... Why is 1.0.5 the latest fw for me? Are we poor eu people getting mobbed? Oh okay, so it comes along with the normal patches trough the ninebot app? Since my last posts, so I updated the firmware BMS to version 1.1.7. And I did the same kind of long-term readings to get reliable data and to understand how this standby consumption is. After turning off the wheel, I first waited for 24 hours so that the voltages of the batteries are well stabilized. I was optimistic that the BMS firmware update v1.1.7 corrects this failure to restart the Z10, but no, it is not. I notice that these two values of consumption in stand-by state are much higher than those which I had obtained before (see my post above). I don't know why. I decide to continue my investigations to find where will be lost this current of stand-by. I unplug all the connectors of the battery pack: the two XT60s, the 4-pin charging connector and the 2-pin communication connector. I also took advantage of the update of the BMS firmware v1.1.2 to v1.1.7 to make another test : the assymetrical regeneration of the two batteries. For some time I had read on the French forum that the firmware v1.1.7 corrected the problem that only one of the two batteries recharges in a long descent. So I did this test myself by noting the percentage of the charge of the two batteries before and after going down a slope of about 90m (280 ft) over a length of 1200m (0,75 mi) (Roule mountain, Cherbourg). This test, I did it twice: once with the firmware BMS v1.1.2, and I did it again in the same conditions a few days after update v1.1.7. In both cases, the battery 1 remained with a percentage unchanged, and the battery 2 increased by 5% the first time, 6% the second time. So I think that v1.1.7 does not fix this bug. I think it is logical because the regeneration current enters the XT60 connectors, and therefore comes from the motherboard. Nothing is less certain that this motherboard, even if its firmware was different, allows to distribute differently the energy returned by the inverter bridge. This possibility of regeneration must depend on the electronic design of the motherboard and not its software firmware or that of the BMS. The good thing is that fortunately all the time that these measurements took me, I could still ride on my Gotways MS3 and Tesla! 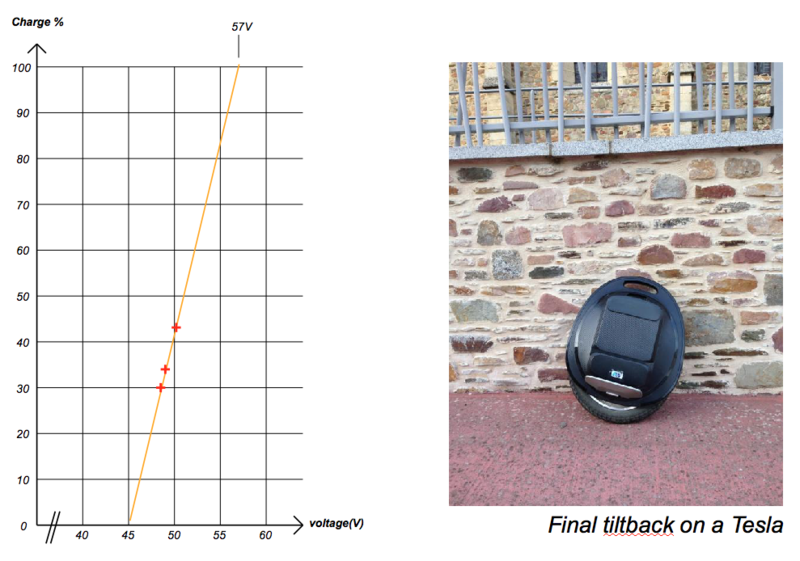 For information, I have just finished the same kind of measurement readings on my Ninebot S2 in standby mode : for 9 days and 7 hours, the voltage drop is 1,005V, thus 0,0045V/h… It's the same order of magnitude that I measure on the Z10 ! I will confirm (learned the hard way) that the Z10 will not turn on with a relatively low battery. So if any Z10 owners are trying to get home and the battery is getting low, do not take a break and turn off the wheel while you're taking a sip of water. You'll be walking the rest of the way home. Another stupid design decision by Ninebot. That numbers are amazing every time again! ~10% of ~1000Wh in 7 days! Gives about 0,6W of continous power dissipation for nothing! Really crazy! By using sleep/standby modes while the wheel is turned off there could be a good chance to get consumption down many magnitudes with a firmware update! Ps. : 1% in 8 days should give ~2years from 100% downto 0. This could be about the range of self discharge of Li Ion cells? At first, the fact that the wheel with low battery may not restart also worried me ... not even possible to stop for a moment while leaving the wheel running since it turns off automatically after a few minutes. And in the exceptional unpredictable cases of a loss of control or a runaway of the wheel which forces to turn it off and on again? Since I realized that we can still restart the Z10 with a weak battery, I am more serene. I know it will not let me down. I have already tested the method I give in the video of my previous post to restart the Z10 with about 10% of battery. And it works fine. The wheel starts again and is as functional as it was before it was turned off. Obviously with low battery speed is limited, but this could still allow to go home. Somehow i don't get the numbers really together.... Or Ninebot is calculating the Charge % in a very "own" way? A battery with 4.2V has 100% charge, with 2.5V 0% charge (according to the datasheets!). This would be the full capacity (~998Wh) for the whole pack, and more than is used by the wheel and reported as capacity. So the usable Voltage Range from 2.5V to 4.5V are 1.7V difference. 0.00568V per hour should make 0.00568V/1.7V = 0.33% charge used per hour. When I trace the points I have taken on a graph, I find them finally very coherent. Regarding discharge of a cell, none of my wheels go down to 2.5V per cell even with the wheel completely empty and fortunately. We know that 2.5V is the minimum voltage below which chemical deterioration of the cell can can occur. This value is therefore a part of the 'absolute maximum ratings' given in the manufacturer's datasheet for these batteries. But in practice, on the wheels that I own (MS3, Tesla, Z10), none goes below 3.3V per cell. Discharged until the final tiltback as shown in the photo below, my tesla was 2% just below 67V, which is more than 3.3V per cell. The only time I completely drained (roughly) the battery of my Z10 after a 64 km ride at 0°C, I could hear the very low battery beeps. I did not know there was a specific sound for this. It was no longer the beeleep beeleep beeleep that we usually hear. These had given way to the same sounds that are heard at the very first start of the Z10, when it is not yet linked to the Ninebot account. This surprised me. To date I have heard in these conditions of very low battery only once. Probably you will have made the same observation with your Z10. That day I was over 46V, so about 3.3V per cell. This voltage (arbitrary?) 3.3V is not imposed by the BMS but by the motherboard to still allow the balancing of the wheel when pushed with the trolley, and especially to remain at a voltage greater than the limit value of 2.5V. In the end, with the experience I have, I never rely on the percentage of battery given by the app. I know (very roughly) how many miles of autonomy I will have. I adjust this according to the season (temperature) and the average speed that I will try to respect. I'm rarely wrong. It must be believed that it works: in 16000 km, I finished the ride by walking because of the empty battery only twice. Most of the time, I empty the battery and go home with the beeps. 57/14~4.1V is imo with most wheels already 100%, as the ~3.3V are 0% for most wheels. I just had a battery issue (first of any issue) with my Z10 just now on lunch. Said "bad communication with battery 2". Battery one showed 78% and battery 2 showed 20% before not showing up at all. I luckily have my charger with me. I'm going to charge it and see if it persists. I have not updated the BMS firmware. 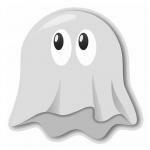 I'm still on v1.1.2. I didn't see any prompt or option to update the BMS firmware in the Ninebot app either. Is it hiding somewhere I'm not looking? I went to settings < battery to look but just showed current BMS without choice to update.